BINUS UNIVERSITY’s booth at the 21st Education and Training Expo (ETE) 2012 in Assembly Hall, Jakarta Convention Center, was packed with visitors, Friday (17/2). Located right in front of the main entrance, the booth had a very strategic position. 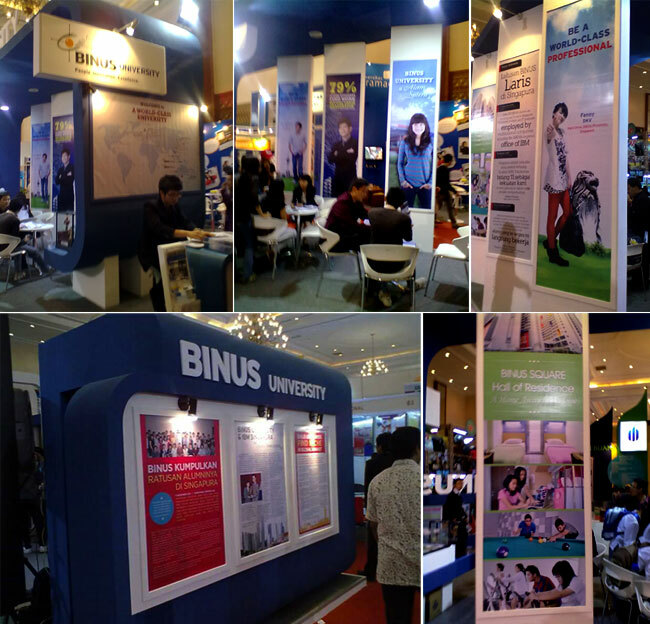 No wonder, the 6×15 m2 booth was surrounded by thousands of students eager to get educational information from BINUS UNIVERSITY. BINUS UNIVERSITY had several agendas for the expo, such as cup cake decoration (presented by Hotel and Management), telepros, inventor & autocad demo (presented by Industrial Engineering), Screen Printing Workshop, Robot Making World, BINUS TV Mini studio (presented by Marketing Communication) and Digital Painting (presented by Creative Advertising). Moreover, there was also a talk show with the theme of Development of ICT Especially Mobile Apps & Tech & Future Employment Opportunities. Another theme presented was Potential for Digital Creative Industry in Indonesia & Game Design and Development. BINUS UNIVERSITY, BINUS International, BINUS Business School, BINUS Graduate Program, BINUS Online Learning and BINUS Square all participated in this exhibition. More than 100 reputable and favorite universities, from Indonesia and other countries, participated in the 21st Education and Training Expo 2012 which occurred for four consecutive days (February 16-19, 2012). In addition to socializing educational programs, they were opening registration for prospective students. The purpose of the Education & Training Expo 2012 is to assist students of senior students in high schools and vocational high schools, along with scholars and professionals, in getting information for higher education, training programs and courses. Prospective applicants are able to choose studies which suit their talents and needs.